One’s world may be defined by available media, and the spread of that media is becoming increasingly larger. The YUL – LAB Project recently met in Chicago to promote itself. I was invited to attend the closing reception. In the world of product research, introductions and research, a city is usually targeted to be a “test market” for this function. In the past, this has usually been a city of a size that isn’t a major market, of a level of taste that would deemed conservative, and located with a relative amount of isolationism – so that word of this new product wouldn’t suffer “market leak”. Like: Peoria, Illinois. Peoria has traditionally been a testing ground for new products. However, even Peoria has been more and more difficult in that last criteria point of “media leak”. These days, one may listen to the radio, watch television or read a newspaper over the internet. I read other cities’ newspapers all the time on the web. YUL is the airport code for Montreal – Pierre Trudeau International Airport. Montreal is promoting itself to be used as a market research laboratory in this project. Montreal is a typical North American city with one exception: it speaks French. Its media communicates in French. Moreover, its French speaking media really doesn’t get much “leak” outside of Montreal, to those other North American markets that speak English. In the YUL – LAB Project, Montreal is billing itself as the perfect test market. If Peoria – a stoic sort of place – were the typical profile for a test market city, Montreal is different. Cosmopolitan, Montreal’s a very stylish and fashionable place, cutting edge at times. I really do like Montreal, but compared to what tastes constituted a test market before: maybe we’re in for some changes. Not all bad, could liven things up a bit. The changing economy and its effects on the retail streetscape may be best studied in the pre-war and post-war streetscape: pre and post First World War. This particular timeframe holds fascination as it depicts a landscape before and after the automobile’s influence. Oak Park offers another excellent set of examples: it has both types of development at hand. Since the 1860’s, downtown Oak Park has been built up next to a commuter train station, and a rapid transit station in time. The largest source of traffic for these train stations was commuter traffic to and from Chicago. Storefronts were built up along adjacent streets. Though this area was never planned, it grew naturally, with many improvements over the years. The commuter train and rapid transit stations are still there, they generate a sizeable amount of foot traffic. While this neighbourhood has some storefront vacancies, it is a sought after location in Oak Park, perhaps one of the most economically vibrant in town. Odd, because this society has become so much more reliant on personal transportation – the automobile – since the initial development. This infrastructure and its layout still seem to work. Granted, there is an ongoing issue about car parking in this area, the sentiment being that more parking garages should be built to provide more accessibility for shoppers; in reality, the parking garages in existence draw on a substantial trade of commuters who park their vehicles to walk to the train stations. As an aside, a very large parking garage might hold as many as 1000 cars, whereas a fully loaded commuter or rapid transit train may hold as many as 1000 people. While parking may be an attraction for commuters, it’s effect is limited. Most transit riders still seem to find other ways to get to the train. While Oak Park grew naturally around its train stations in that era prior to mass ownership of automobiles, the town was bordered by country roads. Using the First World War as a marker, a pivotal point in time because automobiles were becoming more widespread. The original Garden City concept of orderly development around train stations forming towns, and towns separated by open space was becoming passé ; all of the bits of the open space between established towns were now accessible point-to-point by automobile and seemed to be idyllic places to live. These areas were settled as ‘sprawl’. Our urban design patterns were still based on walkable towns, so these new areas settled by “automobile development” were awkward in their layout. Areas of Oak Park like North Avenue were developed in this fashion in the 1920‘s. Small storefronts with large signs were built “cheek by jowl” along a busy highway, originally intended to move traffic from one town to another without stopping in between. Automobile parking happened on either side of this broad right-of-way. Additional parking was provided along the back of the storefronts, allowing customers to enter from either a front or back door. This led to confusion and an informality, as the ‘back doors’ alongside convenient parking also doubled as the service entrance. Architect and Urban Planner Victor Gruen, in his book “The Heart of Cities” chronicled this type of development. In Oak Park, North Avenue has more vacancies than anywhere else in tow, and has become a favourite location for tattoo parlours and palm readers. The Village is probably coveting the property and sales tax revenue generated by marginal uses like these, and that this tax income is more difficult to come by in this economy. Jumping ahead many years, it was the era after the Second World War that developed an urban model that located a building in the middle of a vast parking lot, the precursor of big box retailers and shopping malls. And oddly, this type of retailer isn’t doing that well either these days. The Royal Architectural Institute of Canada holds a national convention every year, entitled the “Festival of Architecture”. This year, the Festival is being held in Saskatoon, Saskatchewan, and its theme will be “Sounds Like Architecture”. Proudly, I will be delivering a talk “Canadians of the Chicago School 1884 – 1935” at this year’s Festival, on June 26. This topic talks of the contributions made directly by Canadians to the development of the 1880’s Chicago skyscraper format, and the contributions those Canadians brought back to create a “Canadian” skyscraper. This is a presentation delivered previously to the Chicago Architecture Foundation, and to visiting student and faculty groups from various Canadian and European universities. I’m constantly drawing on research from many sources in preparation for this preparation. I need to apologize over how this font appears when compared to other posts. I’ve recently started working from a different computer, and this blog software recognizes and displays this font differently. This entry may even look different from the last entry, or the entry previous to that since this is being written into the blog directly. We never had this problem using Morse Code. So, what was that you wanted to know? The last month or so has seen a flurry of behind the scenes activity at the Babuk Report. All for the good. It’s all about Learn About Chicago a venture described elsewhere in this blog. Learn About Chicago is an initiative that is an extension of the sort of architectural awareness and organization that I’ve done in past. It is a division of Babuk Presentations, Inc. The major focus of Learn About Chicago targets university students who want to spend an extended period studying Chicago’s architecture. It may be a studio class led a professor from a visiting institution, or it may be a program of presentations and interactive learning experiences that I assemble. I work with the visiting groups to tailor make a Chicago experience that they will take with them, to further their studies at their home collegiate institution. Learn About Chicago can work with many other groups wanting a series of presentations – presentations delivered by myself or others – bundled together into a program that describes Chicago. Tour About Chicago is another division of Babuk Presentations Inc. Tour About Chicago focuses on delivering articulate and informative presentations about Chicago’s architectural and railroad history. I weave Chicago’s historical sites into captivating and fascinating story lines. Tour About Chicago is much like what I’ve been doing all along. Many of the Tour About Chicago presentations – especially those that describe Oak Park and the near western suburbs of Chicago will be marketed through Visit Oak Park. Tour About Chicago specializes in the little known parts of Chicago. Quirky history. Babuk Presentations, Inc. is a new direction within my architectural practice. It specializes in all types of presentations; graphic design, public speaking and the like. Watch for a revamped web presence soon. 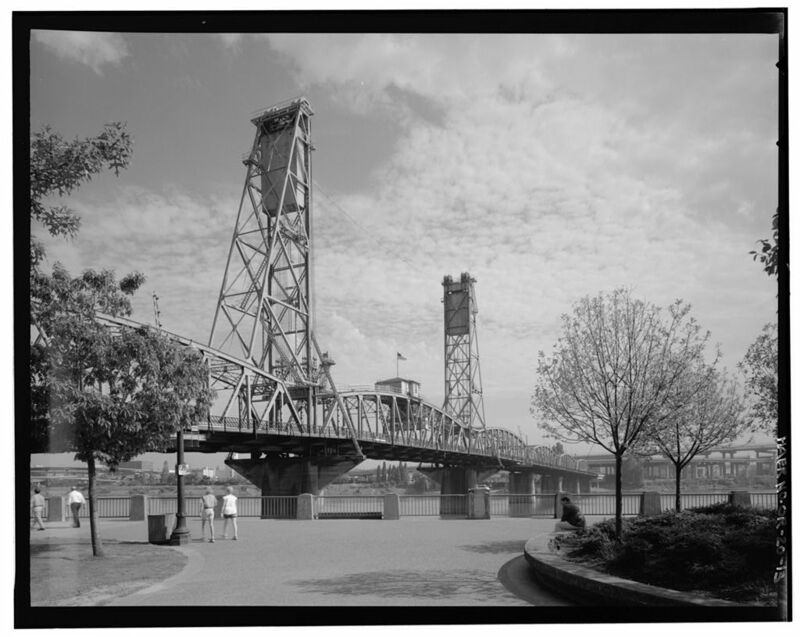 Waddell & Harrington, Consulting Engineers of Kansas City, built many of their patented bridges at many locations throughout the U.S. One example is the Hawthorne Bridge in Portland, OR, spanning the Willamette River. This bridge is configured as several individual spans that connect to the vertical lift span. This bridge truss however, is configured as a “four sheave” design with its counterweights concealed within the vertical, tower trusses. The lift span is 250 feet long, and can raise 110 feet for a total clearance of 160 feet above the river. Cables carry two 424-ton counterweights that are adjusted for tension with turnbuckles. The lift span is operated by two 125 hp motors. The Hawthorne Bridge has been described as the oldest extant example of this type of a four sheave vertical lift bridge in the U.S.
Darrel G. Babuk, AIA, MRAIC is an architectural historian who specializes in presentations of early industrial age structures. His presentation topics may be seen at www.learnaboutchicago.com. Image 1: Photo from Library of Congress, Prints and Photographs Division, Historic American Buildings Survey or Historic American Engineering Record, Reproduction Number HAER ORE, 26-PORT, 10-8. 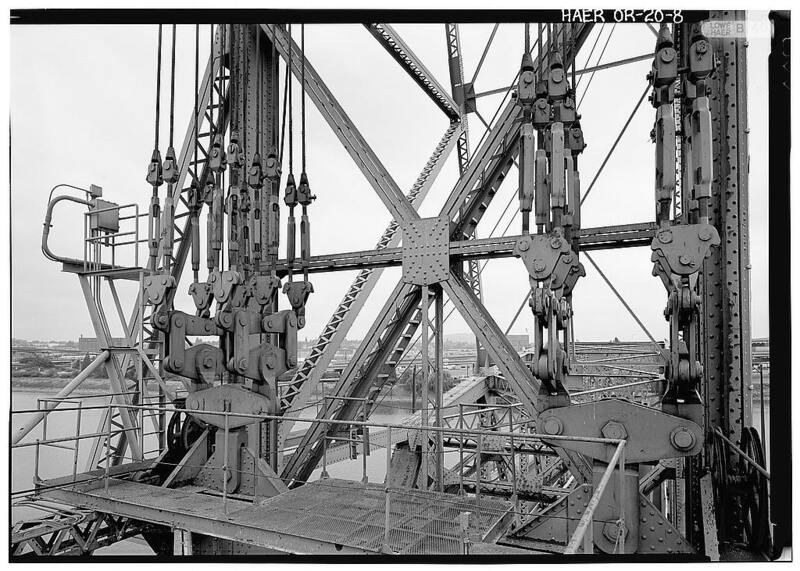 Image 2: Photo from Library of Congress, Prints and Photographs Division, Historic American Buildings Survey or Historic American Engineering Record, Reproduction Number HAER ORE, 26-PORT, 10-23. 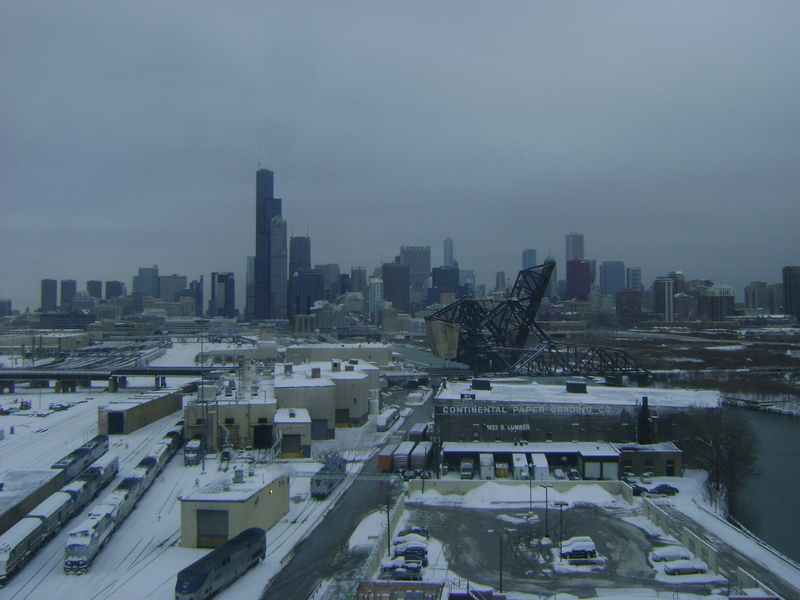 As a sidenote, Waddell and Harrington designed and built several “Center Lift Span” bridges in the Chicago area, including the Pittsburgh, Fort Wayne & Chicago Railway, Calumet River Bridge, (1912 – 1913) and the Pennsylvania Railroad Bridge at 18th and Stewart Street (1910). Would anyone be upset if they learned that Sarah Binks was simply a fictitious fabrication of a University of Manitoba professor? 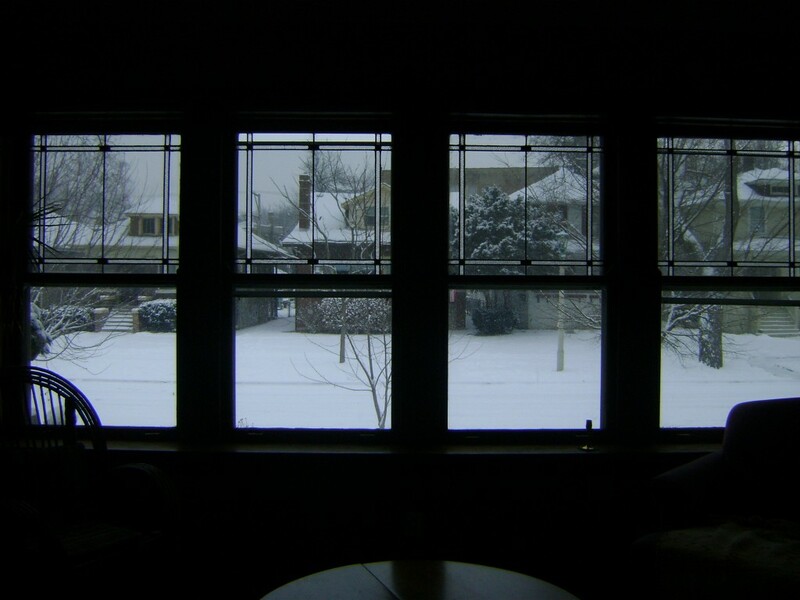 I shall never attempt to write about a snowy winter day in Oak Park ever again. 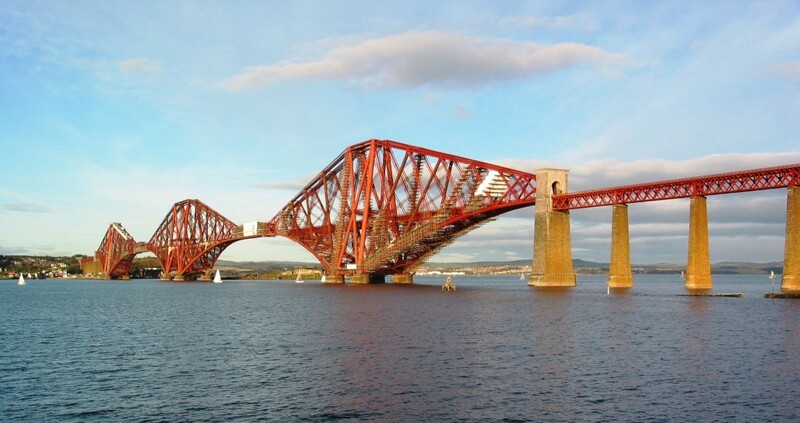 A recent presentation to the Scottish-American History Club about the Firth of Forth Rail Bridge would not have been complete in historical context without mention of the Firth of Tay Bridge Disaster. One in the audience chuckled, and mentioned a poem composed about the disaster written by William McGonagall. Which will be remember’d for a very, very, very, very, very long time…”. Thought of this prevented my writing much about winter. The omni-present whitish glow quietens all. Happy New Year. It’s surprising to see that we’re already a decade into the new century. Previous posts have spoken about vacant storefronts and even vacant buildings, all from the aftermath of the latest economic turn. There is so much vacant space out there that based on current absorption rates, some markets have several years supply of some building types like… condominiums. It could take several years to recover to get back to where we were. This empty space in empty buildings simply sits and waits. No one has really caught on to the idea that this space could be re-adapted to different uses. In the meantime, one may deduce a similar “oversupply” of the people who design and build. In this case, many of these people have “re-adapted” out of necessity. While this is good for them, it has left an enormous void of talent, skill and expertise that has left the marketplace. A colleague (formerly) in the print publishing business suggested that it may take as long as twenty years for the architectural profession to make up lost ground, lost to a “brain drain” caused by the current economy. There are fascinating opportunities coming out of all this. While cities that best depicted the late twentieth century – the Sunbelt – have stalled from an oversupply of built space that led to sharp drops in real estate prices; many cities of the early twentieth century – the Rust Belt – are retreating. It’s like Las Vegas vs. Detroit. Las Vegas just opened an incredibly huge hotel complex; its economic viability is yet to be seen. Residential housing prices in the Las Vegas area are still depressed, though many feel this reveals some “great buys” in the real estate market that services retirees. The retiree market doesn’t depend on finding employment to sustain housing costs. Detroit has even better deals – well, lower prices – in residential real estate. At first glance, Detroit may seem to be unsustainable and unaffordable: although prices are low, the potential market is people who work. In a city without jobs, housing at any price is unsustainable and unaffordable. I’ve heard many a seminar presentation about cities like Detroit recently, and Detroit is the oft-cited example. It was a much larger city in its heyday a few decades ago: having shrunk in population but not geographical area, it’s saddled with much more infrastructure than it needs and can support. Many are projecting Detroit to be a very viable city if it trimmed its infrastructure and broadened its economic base to support a city of its current population levels – still one of the largest cities in the United States. Some are even proposing urban agriculture for Detroit, a very novel “reuse / re-adapt” concept. 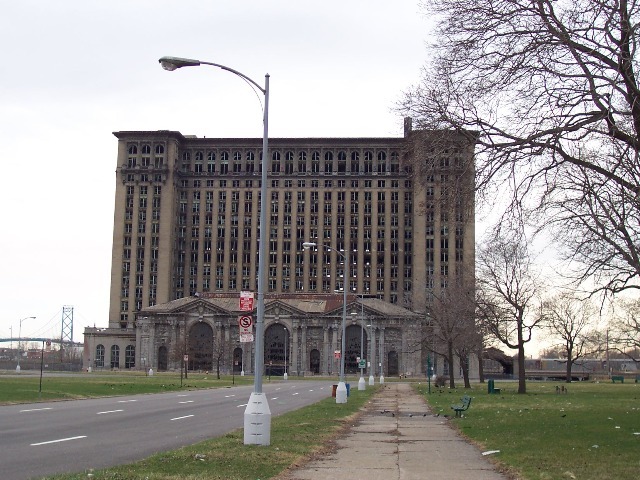 Speaking specifically about Detroit as a precursor and example, it has the potential to be a very vibrant smaller city; the buildings that supported a larger city have been left behind. Several buildings buildings have been left in ruin – the former Michigan Central Railroad Station, various hotels and office buildings, even industrial complexes where automobiles were once assembled. In archaeology, we know of classical ruins, of medieval ruins and the like. Here, we have a new category: modern ruins. Quite fabulous modern ruins, at that. Regardless, it’s still a decade into the new century. Just as the nineteenth century economy was different than the twentieth century economy that followed; the nineteenth century set up the twentieth century’s economy. The same may be true of the twentieth and the twenty first century’s economies. The economic structure of the new century hasn’t revealed itself.